This antique brass floor lamp has a marble base, three decorative light fixtures, with one on top. 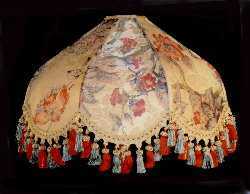 The large lotus-petaled shade is a light gold floral fabric, with muted red and bluish-turquoise colors. The tassel fringe in the same accent colors is very appealing.